While attending the Liberty Medal of Honor Ceremony in Philadelphia on 9/22/2011, Richie had to opportunity to meet Former Secretary Robert M. Gates. Suite101 interview with Richie McDonald, former lead singer of Lonestar, who is recording as a solo country artist, where he talks about his new projects. On Friday, August 26, 2011, Suite101 had the opportunity to speak with acclaimed country singer-songwriter Richie McDonald, who was the former lead vocalist of the Lonestar. While with the band, their hits Amazed, I'm Already There, Front Porch Looking In and Mr. Mom all went to the top of the Billboard Country Charts. Presently, McDonald is recording as a solo artist, and he opens up about his latest musical endeavors. CountryEntertainmentUSA.com gives 5 Stars to SlowDown! As the lead singer for the group Lonestar, Richie McDonald's vocals became a staple to country music fans. 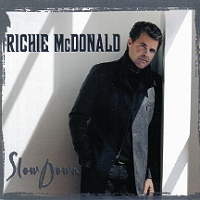 Now with the release of his solo CD, Slow Down, Richie's vocals are as solid as ever with his signature heart-wrenching delivery. Known as an extraordinary ballad singer, he took this opportunity to record an album of ballads. Richie co-wrote all twelve songs on the project, which is no surprise with his past songwriting credits. The CD is full of positive, family and inspirational messages from "Hey God" to "Footprints On The Moon." Overall a satisfying package. On June 14, 2011 Full Sail University (fullsail.edu) was proud to welcome award-winning country singer / songwriter and former Lonestar front man, Richie McDonald, to its campus for an exclusive presentation held at the Full Sail Live venue. McDonald's Tour Manager and Full Sail Show Production graduate, Kevin Lammons, joined the event to discuss his career in the music industry and to share insight into the world of professional concert touring. Recognized as one of country music's best singers and the former front man of Lonestar, Richie McDonald is the voice of songs like "Amazed," "Smile" and "No News." In addition to sharing his talents as a performer, he is the songwriter behind such hits as "My Front Porch Looking In," "Let Them Be Little" and "I'm Already There," which became an unofficial anthem for U.S. troops serving in the Middle East. McDonald has earned six gold and platinum albums, numerous CMA and ACM awards, as well as BMI awards for songwriting. "It's great to be here at Full Sail University," said McDonald. "I always knew I wanted to be an artist, so I'm happy to be able to give back and to offer guidance to the students by sharing experiences from my career." McDonald discussed his career in the music industry ranging from recording and touring with Lonestar to writing for well-known artists such as John Michael Montgomery, Clay Walker and Sara Evans. Joining him onstage during the lecture, McDonald's Tour Manager and Full Sail graduate Kevin Lammons, spoke to students about the world of concert touring and his work as a live sound engineer with national touring acts which included 5 years on the road with Lonestar. "Richie and Kevin's presentation offered an inspiring and unique look into the professional career of a musician from both the perspective of a songwriter and performer," said Dana Roun, Director of Audio Arts for Full Sail University. "This event provided our students with the opportunity to learn about various aspects of the music industry from an award-winning artist, while gaining first-hand knowledge from a member of our alumni." Since 1979, Full Sail University has been an innovative educational leader for those pursuing careers in the entertainment industry. With over 34,500 alumni, graduate credits include work on OSCAR®, Emmy® and GRAMMY®-winning projects, best-selling video games, and #1 grossing U.S. concert tours. Full Sail's 191-acre campus and online education platform proudly welcomes over 13,000 students from 50 states and 49 countries. Full Sail currently offers a total of 37 Associate, Bachelor, and Master campus degree and online degree programs including: Computer Animation, Creative Writing for Entertainment, Digital Arts & Design, Digital Cinematography, Education Media Design & Technology, Entertainment Business, Film, Game Art, Game Design, Game Development, Graphic Design, Internet Marketing, Media Design, Mobile Development, Music Business, Music Production, New Media Journalism, Recording Arts, Recording Engineering, Show Production, Sports Marketing & Media, and Web Design & Development. Full Sail received the 21st Century Best Practices in Distance Learning Award from the United States Distance Learning Association; was named the 2008 "School/College of the Year" by the Florida Association of Postsecondary Schools and Colleges; The Harvard of Game Schools by Tips & Tricks Magazine; one of the Top Five Game Degree Programs in the world by Electronic Gaming Monthly; one of the Best Music Programs in the country by Rolling Stone Magazine; and one of the Best Film Programs in the country by UNleashed Magazine. The first annual Tim Tebow Foundation Celebrity Golf Classic was held May 7th on Dye's Valley Course at TPC Sawgrass. The list of celebrities participating included a number of former Gators (including Richie & Rhett McDonald - second and third from the left in the front row) as well as former Florida head coach Urban Meyer and current head coach Will Muschamp. Former FSU standout Christian Ponder, Adrian Peterson as well as Fred Durst from the group Limp Bizkit. The shotgun start tournament included novelty holes that included speed golf, a punt, pass and kick start and a basketball free throw hole to shave a point off their team's score.